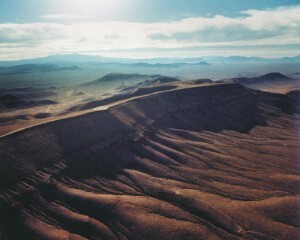 Yucca Mountain is located in western Nevada, near the California border. While this land has been occupied for thousands of years by the Western Shoshone and Southern Paiute indigenous peoples, it was recently the center of a controversy concerning the proposal for a large-scale storage of mass amounts of nuclear waste. The area has been abused since 1951, when the military designated it as a nuclear test site: approximately 1,350 square miles of the 43,000 square miles of the Western Shoshone’s land has been destroyed by craters and tunnels that cover the landscape. This activity has already had extremely detrimental health effects on local communities, especially many of the Shoshone people who reside on a reservation in close proximity to the test site. High concentrations of low-level radioactivity have been detected in this community, and residents have reported “unusual animal deaths, human hair loss, the soil in the area turning a dark black color, along with increases of cancer and birth defects”. To add to this burden, government scientists began surveying Yucca Mountain in the late 1970s as a potential site for nuclear waste storage. By 1987, this was the only site being considered for more than 77,000 metric tons of spent nuclear fuel and radioactive waste. The proposed project involved burying the waste in steel containers deep within the mountain. This waste would remain lethal for approximately 10,000 years, yet the canisters were not guaranteed to survive as long. Opposition to the project argued that deterioration of the steel containers or seismic activity (which is already proven to be frequent in the area) both threatened to cause leakage of the waste, which would likely pollute the water table that currently supplies water for many local communities and adjacent farming regions. The project was disputed for decades, but finally in 2009 President Obama announced that the federal government would begin searching for alternative storage options. In 2010, the United States Energy Department announced that it would withdraw its license application for the project, finally ending the decades-long struggle over Yucca Mountain as a storage site for nuclear waste. 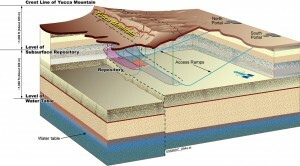 To the Western Shoshone people, Yucca Mountain is Snake Mountain–a place of powerful spiritual energy with “rock rings that transmit prayers to the Great Spirit and messages back to the people.” According to archaeologists, Shoshone people have lived on Yucca Mountain and the surrounding territory since precontact and early historic times, dating back as far as 12,000 years, subsisting on hunting and gathering. It is believed that large family groups moved from winter base camps in lower valleys to spring, summer, and fall camps on the highlands of Yucca Mountain. These people had a close relationship with the mountain, deeming it a significant source of “puha”, or power: “an impersonal force which potentially can reside in any natural or living thing (water, geographic sites, plants, animals, persons, etc.)”. The Shoshone believe that the Earth is sacred and it is their responsibility to protect it, for this reason they viewed both the nuclear test site and the proposed storage site as harmful to all of Earth and all of its inhabitants. During the surveying of the proposed storage site, archaeologists commissioned by the Department of Energy visited the mountain, accompanied by ten representatives from the Shoshone community. This was the first time since the 1940s that members of the native community were allowed to visit their sacred sites. The survey found more than 400 sites of archaeological significance, and the teams also visited sites with less physical manifestations, but cultural and spiritual significance: “sites with mythological reference, water sources considered sacred, plants and animals used for medicines as well as foods, potential burial areas, etc.”. The archaeologists found tools and manufacturing debris that dated back 12,000 years. They observed that around 6,000 years ago, the Shoshone moved high up Yucca Mountain, establishing temporary camps on saddles and low passes, subsisting mainly on hunting. Around 2,000 years ago, they found that the settlements shifted to small rock shelters atop steep slopes. At these sites, archaeologists found intermountain brownware, a type of pottery characteristic to the Western Shoshone and Southern Paiute people. The Shoshone representatives who accompanied the archaeologists stressed that when entering these sites after such a long absence, it was necessary that they make specific prayers to the spirits that were present. They gave small amounts of food to the four directions in order to meet this responsibility. Additionally, the Shoshone representatives stressed the sacredness of the water in the springs that dotted the mountain, and expressed distress over the idea that the water could be contaminated. The representatives also knew of petroglyph and pictograph sites in the vicinity, as well as specific ceremonial areas. Of special significance was the Annual Mourning Ceremony site located in a canyon on the mountain, considered a significant source of puha. After their visits to the sacred spots, the Shoshone representatives concluded that if land-altering activity were to occur, all the archaeological sites should be avoided. Generally, they expressed that the idea of “sacrificing” the area was foreign to them. Rather, they thought that the already poor conditions should be made right, not worsened. In terms of the legality of the government’s use of the land, the Western Shoshone have legal claim to the land. In 1863, the Western Shoshone and the federal government signed the Treaty of Ruby Valley, declaring territorial sovereignty for the Shoshone and designating 60 million acres across Nevada, Idaho, Utah and California. Although this land was never deeded back to the United States, the government now claims 80- to 90-percent of the land for military use. In 1979, the Indian Claims Commission offered a monetary award to the Western Shoshone people for the land, but the people refused compensation in order to pursue their legal claims to their land. During the legal battles over Yucca Mountain, the Shoshone people partnered with environmental groups in order to fight the proposed project. Leaders within the Shoshone formed many groups and coalitions to raise awareness of potential health impacts of the storage of the waste, address health issues that were already prevalent in the community, and fight the “nuclear colonization” that they were facing. Groups included the Western Shoshone Defense Project, the Western Shoshone Health Project, the Western Shoshone National Council and The Center for Technology, Environment, and Development. While leaders in the community could appeal to other governmental leaders and decision-makers on the grounds of detrimental health impacts, it was less common that the Shoshone could fight the project proposal on grounds of spiritual sacredness of the land. Besides writings by local Shoshone that reached small audiences, the legal rhetoric was largely lacking any mention of the sacredness of the land to the Shoshone people. And while the nuclear storage project was closed, the Shoshone continue to fight for rights to their land, a large majority of which is in the hands of the U.S. military. Commonly viewed by outsiders as a wasteland with little advantages besides potential mining for minerals, the Shoshone struggle to establish the land as having great cultural and spiritual significance to its people. Although they succeeded in protecting their sacred areas from nuclear waste contamination, the Shoshone still are restricted access from these sacred sites that are central to their belief systems and customs. Catherine S. Fowler, Native Americans and Yucca Mountain: A Revised and Updated Summary Report on Research Undertaken Between 1987 and 1991 (Reno, Nevada: Cultural Resource Consultants, Ltd., 1991), 1-135. 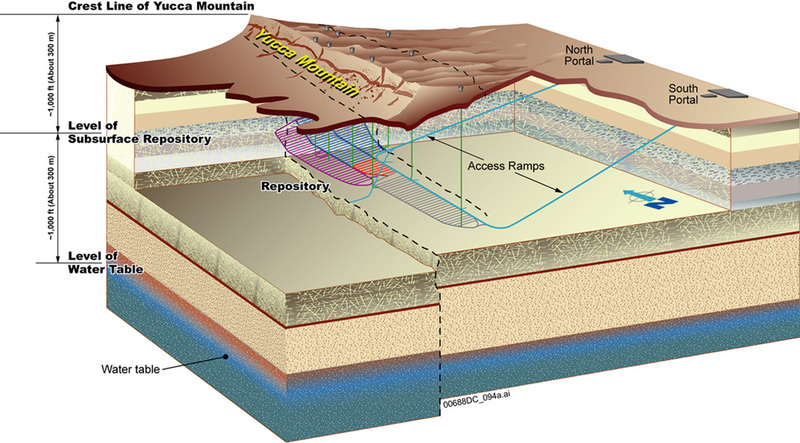 “Environmental Justice Case Study: The Yucca Mountain High-Level Nuclear Waste Repository and the Western Shoshone,” http://www.umich.edu/~snre492/kendziuk.html#TOC. 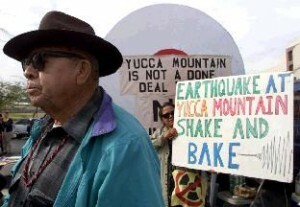 “Sacred Lands Film Project: Yucca Mountain,” last modified April 1, 2010, http://www.sacredland.org/yucca-mountain/. Winona LaDuke, “Reclaiming Our Native Earth,” Earth Island Journal Spring, 2000: pp. 1-3.